The body of Amir Hussain, one of the coal miners trapped inside a coal mine at Khloo Ryngksan in East Jaintia Hills district was handed over to the family on Saturday. The body was identified at Khliehriat CHC by his wife and mother who are from Chirang district in Assam. East Jaiñtia Hills district deputy commissioner, FM Dpth said that the body was handed over to the relatives this morning. 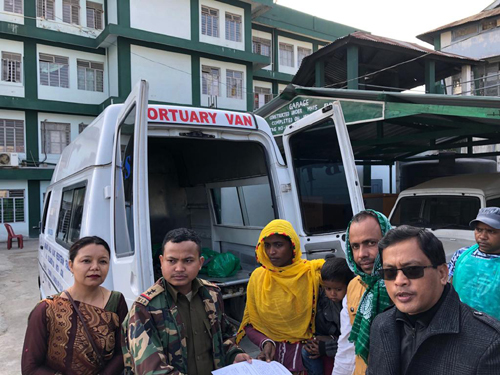 The district administration was also helping the bereaved family in transporting the body to the deceased’s village in Chirang district. Reportedly, 15 miners were trapped inside the coal mine since December 13 last year. The body of Hussain was retrieved on Thursday evening, after the Indian Navy divers detected the body inside the mine on January 16 by using their underwater remotely operated vehicle. Rescue operation is on to locate the other miners who are still missing. The NDRF, SDRF, Navy, Odisha fire services, Coal India Limited, Kirloskar and other agencies are coordinating in the operation.